I’ve been the house cook for the last 30+ years. It just wasn’t when I became a married man, or, a father of six. It goes way back. Much farther than that. I go back to 1984. I have to say, I had the burn to cook at a very young age. I found myself to be immediately comfortable in front of the stove, or, the grill. I have never been intimidated to learn different techniques. No problem to fool with knives, or, mess with the heating elements. My first independent leap of faith came in my teens. All four boys were past being little and we were all in that awkward stage of our lives. Those days, all we really worried about was what wa s going to be for dinner. I feel like the wrath of fielding that question 4 jillion times in a row, finally broke my Mom. She threw in the towel. My mom had enough going on. Raising four wild boys, by the end of the day, she was pretty worn out. We didn’t live by the belief that the drive thru was an option. We lived by modest means. We prepared food to use over the course of a couple of days, even if that was humanly possible. Four hungry boys can mow through some grub. Finally. As it was a beat down by design, Mom gave me the reigns of the kitchen, by my request. I felt comfortable in the kitchen at a young age. Each week, she handed me a signed, blank check and put me in charge of the cooking/shopping for my family. It was about shopping smart. I was learning how to make the dollar work with four hungry boys and a southern man that liked the flavor of simple things. No cartwheels spun for fancy looking, complex meals. if you wanted to paint a smile on Pop’s face, hook him up with a nice t bone and baked potato! I bought the basics; meat, fruit, veggies, and a loaf of sliced bread and a loaf of Italian bread. I could only go to the store once a week. I had a list. I had to make it work. As a sixteen year old, I had to learn quickly if I wanted to keep my new role as Ashby Family Executive Chef. So the history, or background, of our lineage. Many folks relate how they were raised per their faith. I relate to being raised Southern. My world, forever, was homemade cornbread, brown beans, oven fried chicken and green beans. Sliced cukes and sweet onions covered with crushed ice and red wine vinegar, breaded tomatoes, mac/cheese, collards…..get the idea? My grandma, Barbara, and mom’s mom, Gertrude, took the kitchen responsibilities off my hands when we traveled to Ky/Mo for the annual summer station wagon trek south. There, the game was elevated. My grandmas could do more to food with a pairing knife and the sweet sound of their voice, singing songs they loved from the Victrola in the kitchen, than I can with my arsenal of cooking tools. It was pure magic. They cranked out world class chicken and dumplings that would test your senses with each bite. The slightly dense dumpling paired with that hot, velvety chicken gravy….my goodness. Hot Browns….a classic Kentucky dish made with crisp toast, topped with salty bacon, thick sliced, juicy tomatoes, and one of a kind cheese sauce all broiled to perfection, was a regular on Sunday. I think back now….how lucky was I to get informal lessons from whom I badge the pioneers that paved the way for my love for food. They both have passed. I am fortunate enough to be able to trigger my memory banks to recall, not what it tasted like, but the comfort that it created for me. 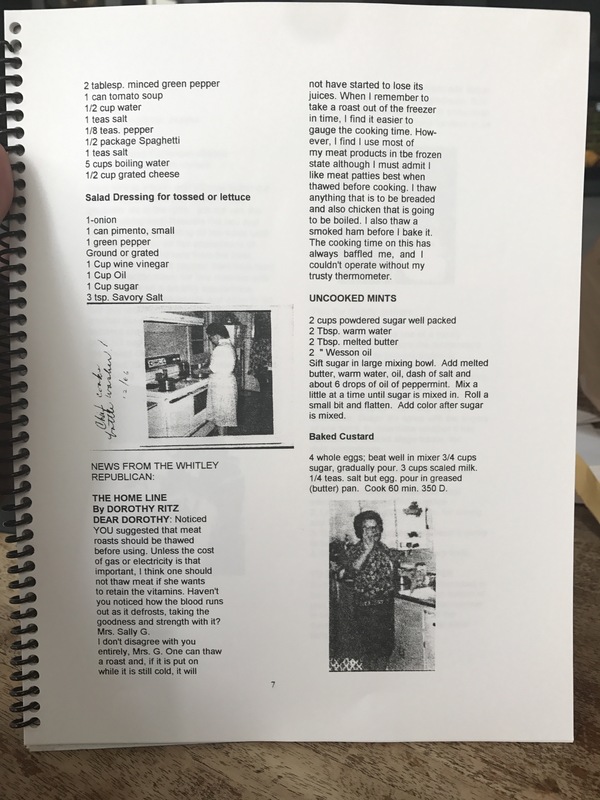 Thankfully, my brother, Rob, found many recipes that were written years ago. Back then, it was the thing to trade recipes and keep them in an index card box, much like a scrapbook. Not only did you get the list of ingredients, or the directions to prepare them, but you got a story. For instance, you could get a brief passage on why apple pie was served every Easter. You might also get the inside scoop on Aunt Ethel, and her snoring, while learning how to sweeten up a pot of snapped beans. Did I tell you about my Uncle Jimmy? My Uncle Jimmy….he found regional fame in Iowa as a radio show host. For years he did different things, but his love was radio. His claim to fame was interviewing Elvis before Elvis was King. In his hobby job, he had a cooking radio show. For a number of years, the ladies in the area would swap and share cooking ideas and recipes. He turned that show into a series of cookbooks that I reference often in my culinary lab at home. Ladies and Gents, I’m talking about my food DNA. My culinary backbone. I’ve come to believe that this thing they call BBQ truly defines me. It’s not only the “food over the fire” that I am always mesmerized by…that’s a given. It’s what goes on during the time that the smoke is rolling over that carnivorous goodness. It’s the history. It’s the experience and the memories. You can’t leave out the flavors, the anticipation, and the ultimate goal..the satisfaction. Grandma says you can’t talk while you eat. It’s not because it’s rude to show your food. It’s so you can concentrate on what’s going on in your mouth. Its the gateway to your soul. Amen to that!! Thanks for letting me give you a little peek inside my world. Hope you have a good one. Until next time, see y’all around the smoker!